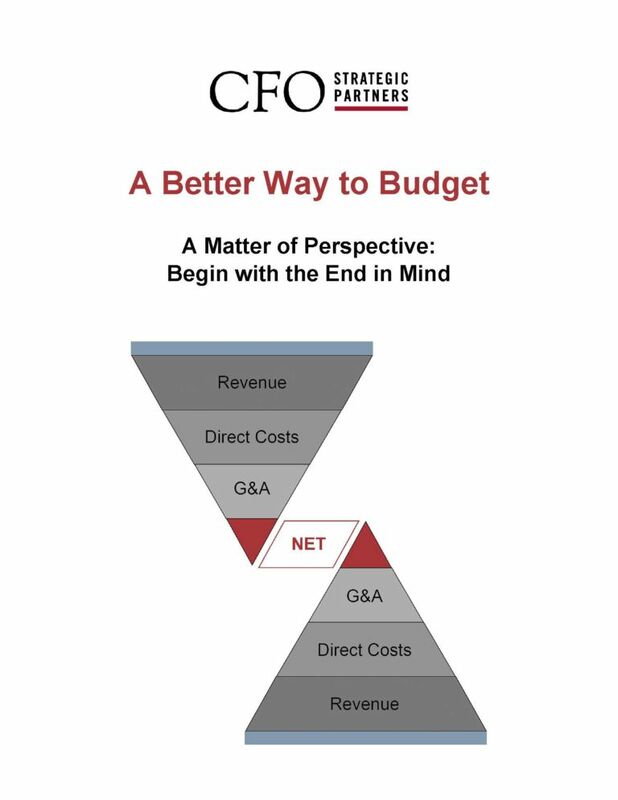 Most CEOs believe that the actual process of creating the budget and forecast is the most important part of the equation. Sure, the more detail and analysis you include, the more accurate you can be. However, most CEOs get trapped in the process, which is not where the most value lies. As the CEO, your job in the budgeting process is NOT to determine which forms, processes, spreadsheets, or computer programs to use and then gather your team for endless and exhausting meetings. The greatest value in the budgeting exercise is through addressing these 5 critical questions. 1. How much money do I (and the other owners) want to make next year? a. How much do I want my company to be worth in those 3-5 years? 3. What capital expenditures or additional investments in my company do I want to make next year? 4. Do I anticipate my overhead/fixed expenses to change dramatically next year? If so, why and by how much? 5. What gross margin can I reasonably hope to achieve next year? Most CEOs begin the budgeting process backwards. Starting with the revenue and spending hours dissecting customers, trends, and backlogs to try and determine next year’s projected revenue, will not address the aforementioned questions. In fact, just the opposite. This process sets the owner up to take the leftovers. CEOs need a dramatic paradigm shift when creating budgets. Start with the bottom line. By asking how much money the owners want to make, or how much they want their company to be worth in 3-5 years, allows the CEO to determine the cash flow the business needs to generate next year. Once this question has been answered, 90% of the most critical part of the budgeting process has been completed! Next, work that cash flow figure backwards. By factoring in capital expenditures or additional investments the CEO wants to make, we derive at net income for the upcoming year that the business needs to generate to achieve those goals. We then factor in fixed costs/overhead costs to come up with the gross profit margin needed, to achieve this bottom line. Finally, we apply the gross profit margin % to determine the revenue needed for the next year to achieve stated goals. Revenue numbers become a plug… what number is needed to achieve this bottom line. By focusing on the bottom line, CEOs change their mindset about every decision they make in the company. We all know that change is inevitable. You will lose clients you didn’t expect. Cost of raw materials may be dramatically different than what you had planned. While these are critically important changes that must be vetted through your forecasting model, it is equally as important to gauge real time impacts on the bottom line. Having access to this information as an ongoing point of reference, will keep you on track to achieve that bottom line number. CFO Strategic Partners has helped hundreds of companies with their budgeting and forecasting models. We offer strategic discovery sessions with the CEO and management team, as well as individual sessions with the division heads. As we end the year and prepare for Q1, now is an excellent time to consider the budgeting and forecasting process, to help ensure that the best decisions are made in 2019, to protect the bottom line.